How to House Sit Your Way Across the U.S. I recently connected with Tracy, who house sits full time with her husband, Dan. Last year, these two Chicagoland natives decided they were done with the monthly rent payments and gave up their permanent home to travel across the U.S. house sitting for others. They live RENT FREE and work remotely in an effort to reach their dreams of seeing and experiencing more of the U.S. I had the pleasure to ask all of my burning questions, and kudos to them for their honesty! If you’re interested in learning more about them, their travels, or how to become a house sitter yourself, visit their blog Sitters On Tour. Jess: What made you want to drop everything and leave Illinois? Tracy: We’ve always loved traveling together, and did so quite frequently throughout dating and our engagement. We didn’t even think of dropping everything and leaving Illinois until a year and a half ago (December 2015). I saw a news segment on Facebook that featured Round the World Couple, Nate & Jess. The thought of selling everything you had to travel full-time was absolutely mind blowing to me! I wanted to be part of it. Dan loved the idea, too. This opened our eyes to the world of travel bloggers and we were hooked. We followed a lot of different bloggers to see how they were living a full-time traveling lifestyle and making it work (and to live vicariously through them). We kept trying to think of ways that we could make a digital nomad lifestyle work for ourselves, however, we just got married, furnished our new place, and started a two-year lease on our town home. Dropping everything and leaving IL didn’t seem feasible for our situation. I didn’t want to wait 3 years until we could save up 75k like Nate & Jess did! I’m pretty impatient, and so is my husband! Tracy and Dan the day they left Illinois for their very first housesit. In February 2016, only two months after we found out about full-time traveling, I found out I would be losing my job come May. It was a shock to say the least. Dan was already working from home, though, and that was our silver lining. We decided I would only apply for new jobs where I could work remotely, so that we could follow our dreams and pursue full-time travel! Jess: Were you both always on the same page with the idea to house sit across the U.S.? Tracy: We were. I feel very lucky in that respect. This is not something we ever discussed prior to getting married, or even knew about for that matter, so I’m really grateful Dan also wanted to take advantage of the opportunity as badly as I did. We discussed a couple different options for full-time travel and both agreed that house sitting was the best fit for us. Jess: Do you anticipate doing international housesits, or do you want to stay in the U.S.? Tracy: Logistically and financially for us, staying in the U.S. makes more sense. We’re able to drive to our destinations which is cheaper than flying, and logistically it made more sense because Dan needed to stick to his normal working hours when he was working at his previous job. Plus, there is so much of the U.S. that we haven’t seen, so we are seriously thrilled about exploring the different regions together! I would really like to do some international housesits, though. I think we’d regret it if we don’t. I’m hoping to do one or two international housesits next year since we are both now self-employed. My dream house sit destination is Australia, and I would love to spend a month or two over there! Jess: How do you fund your lifestyle? Do you continue to work remotely from each place? What are your jobs? Dan: We continue to work remotely when we are house sitting. We tend to look for longer term assignments, at least one month long, so we don’t have too much disruption to our normal jobs. I run my own financial planning practice where I meet with clients virtually. Tracy also helps out with my consulting business as a virtual assistant for other financial planners. Jess: Did you need to save up any money as a nest egg before doing this, and if so, how much? Dan: We already had an emergency fund of about $15,000 when we started house sitting. Since I was still working full-time when we started, we felt like that was plenty to cover any unforeseen circumstances. Unfortunately, we’ve had to dip into that fund a few times, but we’re glad we had it! Jess: What are you hoping to accomplish by living this type of lifestyle? Tracy: We set a few different goals when we started. First, we wanted to travel as much as we could together before we settle down, buy a house, and start a family. Secondly, we wanted to save money. Since we are house sitting as a means of travel, we don’t pay for accommodation and we don’t have rent/mortgage/utilities, which saves us about $2,000/month! Dan: We also wanted to be our own bosses. I had been pursuing a career change into financial planning, and since we were saving so much money by not paying rent, I was able to quit my job in IT and focus on my business full time. Jess: Do you ever anticipate not being able to secure a house sit that will work, and if so, what's the plan? Dan: When we first started in January 2017, we had no idea whether or not we would link together enough house sitting assignments to last us a full year. If we had a big enough gap in between sits, or we just weren’t able to find anything, our plan was to return home to Chicago and stay with our parents. Not only have we been able to link house sits together with little to no gaps in between, we’re booked up through April of 2018! We’ve also built great relationships with homeowners since we’ve started. Some have offered us places to stay if we ever needed it, which might come in handy if we ever find ourselves without a new sit. Jess: How long does it take on average to research, find, interview for and secure a house sit opportunity? Dan: I set up e-mail alerts on each house sitting website we use, so I am notified right away when a new opportunity is posted. If I see an ad that matches our timeline, I’ll review the profile with Tracy to see if it looks like a fit. If the homeowners are fairly responsive, we can usually go from first contact to an agreement in about a week. I actually secured a last minute house sit in a matter of hours once! Jess: What your number 1 piece of advice for others looking to house sit as a means of travel and adventure? Tracy: The most important thing for housesitting is to do your due diligence. Don’t become too attached to any one potential house sit opportunity. There are SO many out there. If you talk to the homeowner during the interview process and something doesn’t feel right, you don’t hit it off, or they are holding something back (pictures, address, dog licenses, etc) then pass. Dan: Like Tracy said, you have to do your due diligence. Not only with the homeowners, but the area you will be living in as well. Especially if you are on a longer term assignment, you’d want to make sure you’d feel comfortable in that area. If you are house sitting internationally, what is your plan if something goes wrong? Getting stuck in a bad situation is a good way to ruin your excitement for travel and adventure. Jess: Do you travel with a car or cars? How does the transportation work? Tracy: We travel with a Toyota Highlander. 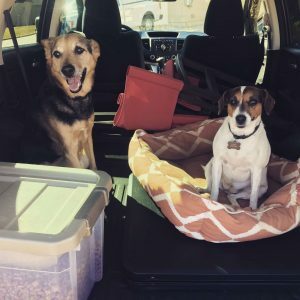 Everything we own fits in the car, and it’s mighty comfy for the long road trips we take! We try to schedule house sits that make logistical sense from where we’re currently sitting so we’re not driving coast to coast. Jess: How did friends and family react to this new lifestyle when you told them? Tracy: Our friends and family pretty much all had the same reaction. They were all supportive of us following our dreams but they were sad because they knew they would miss us. I think our families took it easier because we have plans to still move back home once we’re done house sitting. Jess: What's the biggest challenge to life as a house sitter? Dan: I’d say the biggest challenge to life as a house sitter is the unpredictability. You are taking a risk when you give up everything that you’ll always be able to find assignments. Despite your best efforts to prepare, you might hate the town you visit, or something might go wrong with the house or a pet. We are pretty adaptable, but it’s still a challenge . Jess: What have you learned about each other so far? Tracy: Dan likes to take care of things for us, likes to be in charge. He’s a great communicator and extremely responsive; it’s just in his nature. I never have to worry about reminding him to do anything because he’s just super responsible. Also, I am amazed by how much this guy can drive! I think I drove a grand total of 6 hours (if that) on our trip from Chicago to Durango and only 2 hours from Phoenix to Sacramento. The man does NOT like sitting idle in the passenger’s seat! Dan: I’ve learned that Tracy loves cats more than I thought she did! I always knew she was a dog person, but it’s been fun to see her bond with our many feline companions. I’ve also learned that Tracy is committed to making our dreams a reality. We’ve been faced with a few challenges since we started, but she never once wanted to give up. She has taken each challenge as an opportunity to learn and grow so we can become better people. Jess: What have you learned about yourselves? Tracy: I’ve learned the importance of having alone time. Sounds strange since Dan and I are out traveling on our own without friends and family to hang out with, but him and I are together 24/7. We live together, we travel together, we go to dinner together, we work together, etc. Tracy and Dan skiing together in Telluride, CO. I learned within the first couple months of this journey that it was healthy and necessary to do some things on my own. Whether that be taking a walk or working out, going out to the pool to read a book, getting out of the house, whatever it may be on my own (regularly) is imperative to making myself happy and to having a healthy relationship with my husband. In addition, this journey has confirmed for me that it’s hard for me to be away from family for 6 months at a time. I’m loving this adventure Dan & I are on, but I miss them a lot! Dan: I think we’ve also learned something about our tastes in homes and cities. We’ve both grown up in busy Chicago suburbs, but something about life in a small town really made an impact on us. Having a sense of community is so important to us, and we found it easier to find that in smaller towns. We also used to dream about having that big house with a big backyard, pool, man cave, big bedrooms and bathrooms, etc. Now, we still like the idea of living on some land, but we have been completely happy living in a 1000 square foot guest house for 4 months. Want to learn more about Dan and Tracy's travels or how to become a house sitter yourself? Check out their blog at www.sittersontour.com.